· The latest version of avast! antivirus kernel features world-class detection abilities together with high performance (data throughput). You can expect 100% detection of In-the-Wild viruses and Trojan horses. · The kernel is certified by ICSA and the product frequently takes part in the tests of Virus Bulletin magazine, yielding multiple VB100% awards. · avast! 4 Server Edition is ready to work and even supports large cluster and terminal servers. It contains direct support for cluster setup, including a special wizard that makes the installation on cluster easier. · To set up avast! on terminal environment, you can use another wizard that guides you through the reconfiguration of avast! system for the work in terminal mode. Such a reconfigured avast! system looks (and behaves) to the terminal users as the standard avast! would for workstations. · The support for the terminals is not limited to the terminal services by Microsoft; it is fully functional with Citrix MetaFrame system as well. · avast! 4 Server Edition has been fully tested with all editions of Windows Servers (starting with NT 4.0 and up to Windows Server 2003, including Windows Storage Server 2003 and Windows Datacenter Server 2003). It is fully optimized to take advantage of multiple CPUs and has been stress-tested even on machines with a large number of processors to verify exceptional robustness and scalability of its technology. · Special care has been taken to ensure 100% compatibility with advanced server components such as the VSS (volume shadow copy) and FRS (file replication services), guaranteeing that your server will run flawlessly under all circumstances. · avast! 4 Server Edition works perfectly even on IA-64 and AMD-64 based machines. It is one of the very few AV solutions on the market that covers this fast-emerging platform that is likely to gain more and more importance in the upcoming years. · Resident protection which is the real-time protection on the computer, is one of the most important parts of an antivirus program today. avast! features a powerful resident module that is able to detect the virus before it has any chance to infect your computer. · The file system protection ensures that no virus will be executed on startup, and no virus will be even uploaded to it. The default settings of the resident protection are accommodated to the server environment - it provides thorough scanning. It is possible to adjust the settings to your requirements; you can specify to scan the copied files, or just files with given set of extensions, etc. · An important new feature is so-called "semi-silent" mode of operation. The purpose is to correctly display virus warnings on a server system. It works like this: if a request to load an infected file comes from a network, an automatic action is taken and nothing is displayed. On the other hand, when the request comes from a local or terminal session, the usual interactive mode is used - as in desktop antivirus. · The resident module is highly optimized for speed and tested even in heavy load. It fully utilizes the possibilities of today's powerful servers, such as multiple CPUs (the scanning can be parallelized). · Developed especially to use on Terminal Server, avast! 4 Server Edition contains additional resident modules for e-mail protection (Outlook/Exchange, Internet Mail) and browser protection (Script Blocker). · Even though the Server Edition contains both the user environments of avast! - simple and enhanced - in server usage usually the enhanced user interface will be employed (except for the terminal server). The enhanced user interface gives you access to all the settings of avast!, thus making it possible to fully configure it for extensive scanning. · The main principle is so called "antivirus task" based scanning. First, you define the tasks used to scan for viruses, including the common parameters. Then, you run these tasks (probably periodically). Every task generates some results; of course, you can work with these results afterwards. Resident protection is also a special type of task. · Another feature, closely connected with tasks, is the Scheduler. It makes it possible to schedule the start of a particular task, both one-time and periodically. · To make work easier, Server Edition contains a special notification manager. Here, you can define notification objects and associate them with antivirus tasks (both resident and on-demand). Those notification objects are used in the case when a virus is found. · The new version supports a number of notification objects, such as sending e-mail messages using SMTP or MAPI (Outlook) Also supported are; SMS as well, notification using the Windows popup mechanism (network message), printing the message on a network printer, SNMP traps, or even sending IM messages using MSN/Windows Messenger. · Automatic updates are another key point in virus protection, both the virus database and the program itself can be updated automatically. The updates are incremental, and only new data is downloaded, thus reducing the transfer time. The typical size of a virus database update is approximately of 20-80kb, the program update usually has approximately 200-500kb. · If your Internet connection is persistent, the updates are performed completely automatically in fixed time intervals. If you connect to the Internet only occasionally, avast! watches your connection and tries to perform the update when you are online. · A special feature of the Server Edition is PUSH updates. It is a dramatic change in the philosophy of updates, usually every installed program checks periodically and when a new version is available downloads it. PUSH updates however are initialized by our servers; they result in your computer quickly responding and performing the necessary update. The system is based on the SMTP protocol. The updates themselves are controlled by the avast! resident e-mail providers (MS Outlook and Internet Mail). · The whole system is protected by asymmetric ciphers and is resistant to unauthorized misuse. · The Chest can be thought of as a Quarantine area on your disk having special properties that make it a safe isolated place suitable for storing certain files. You can work with the files in the Chest with security restrictions. · The main properties of the Virus Chest are complete isolation from the rest of the operating system. · A special avast! feature is the boot-time scan. It is important in the case of suspect that there might be an active virus on the computer. The boot-time scan is performed during the start of the operating system, before the virus can get loaded/activated - thus preventing the virus from spreading or taking actions to avoid being detected. · Experienced users may like another Server Edition feature which is the command-line scanner. The scanning can be controlled by many arguments and switches; it can be used as a pipe filter, also a special STDIN/STDOUT mode is available. · The module is intended to be used in BATCH programs. Its output is the same as the output from the Enhanced User Interface tasks (including the report files). You cannot download any crack or serial number for avast! Server Edition on this page. Every software that you are able to download on our site is legal. There is no crack, serial number, hack or activation key for avast! Server Edition present here. Our collection also doesn't contain any keygens, because keygen programs are being used in illegal ways which we do not support. All software that you can find here is freely downloadable and legal. avast! Server Edition installation package is prepared to be downloaded from our fast download servers. It is checked for possible viruses and is proven to be 100% clean and safe. Various leading antiviruses have been used to test avast! Server Edition, if it contains any viruses. No infections have been found and downloading avast! Server Edition is completelly problem free because of that reason. Our experts on malware detection tested avast! Server Edition with various spyware and malware detection programs, including fyxm.net custom malware and spyware detection, and absolutelly no malware or spyware was found in avast! Server Edition. 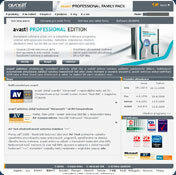 All software that you can find on our servers, including avast! Server Edition, is either freeware, shareware or open-source, some of the software packages are demo, trial or patch versions and if possible (public domain licence), we also host official full versions of software. Because we want to be one of the fastest download sites on the web, we host all the software including avast! Server Edition on our servers. You cannot find here any torrents or download links that would lead you to dangerous sites. Rate avast! Server Edition 4.8.1296.0!